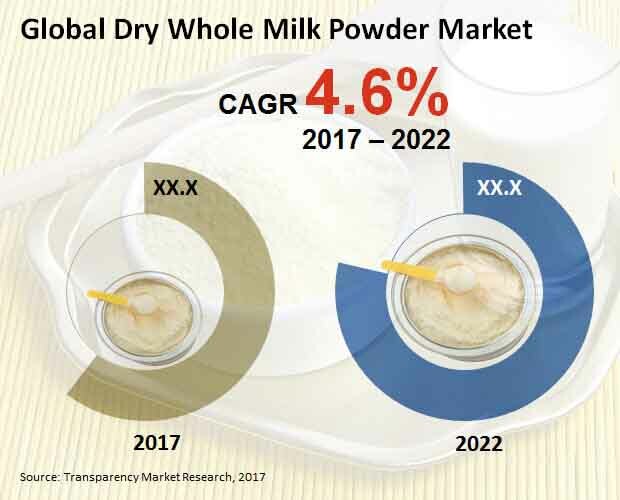 The presence of a large number of players, both large and small renders the global dry whole milk powder market to have a fragmented vendor landscape, finds Transparency Market Research (TMR). While large players operate globally and have established presence, small players have created a niche to serve regional markets. Despite limited outreach, small players hold substantial share in the dry whole milk powder market. The attractive price point of products offered by small players has led these products to establish firmly in the minds of consumers, especially in conservative societies. Product innovation is the focus of most players in the dry whole milk powder market. This includes all-natural products and minimize the use of preservatives to serve the discerning new-age consumer. According to a business intelligence report by TMR, the global dry whole milk powder market is likely to rise at a steady 4.6% CAGR between 2017 and 2022 in terms of revenue. Rising at this rate, the market’s valuation of US$10, 2015.3 mn in 2017 will become US$12, 761.1 mn by 2022 end. Among the key product types, instant milk powder stood as the most attractive product in 2017. Going forward, over the forecast period, instant milk powder is likely to maintain its lead. Geography-wise, Asia Pacific is likely to lead the dry whole milk powder market over the forecast period. This is mainly because of changing lifestyle and increasing consumption of packaged foods. First and foremost, dry milk powder has long shelf life as compared to fresh milk leading to the increasing demand of the former. Dry whole milk powder is easy to store and has a shelf life of few months. Dry milk powder works at par with fresh milk for most uses. These factors contributing to the demand for dry whole milk powder is boosting the dry whole milk powder market. Besides this, dry whole milk powder can be stored up to one year without major loss of value is also propelling this market significantly. In particular, remote regions that have limited supply chain for everyday needs display extensive demand for long shelf life products. Due to insufficient infrastructure and limited transportation for such regions, supply chains are considerably low. Individuals stock long shelf life products such as dry milk powder in place of fresh dairy products for dairy needs. This serves to boost the dry whole milk powder market. Lastly, low volume and low weight advantages of milk powder over fresh milk that makes for easy transportation is also acting in favor of dry whole milk powder market. On the flip side, changing consumer preference leading to the uptake of fresh dairy products is hampering the demand for dry whole milk powder. Difference in taste between fresh milk and dry milk powder is also hampering the demand for the latter. The discerning new-age consumer prefers fresh milk over dry milk for specialty recipes. This hampers the growth of dry whole milk powder market. Also, increasing fads for organic foods is impacting the demand for dry whole milk powder to some extent, adds the report.